Well, nobody asked, but I’m going to tell you anyway. When I started this blog, I had no interest in writing about myself. Although utterly and unrepentantly self absorbed, I leave the how I spend ‘my day’ style of blogging to the original blogger, the estimable Eleanor Roosevelt, and her spiritual descendants. 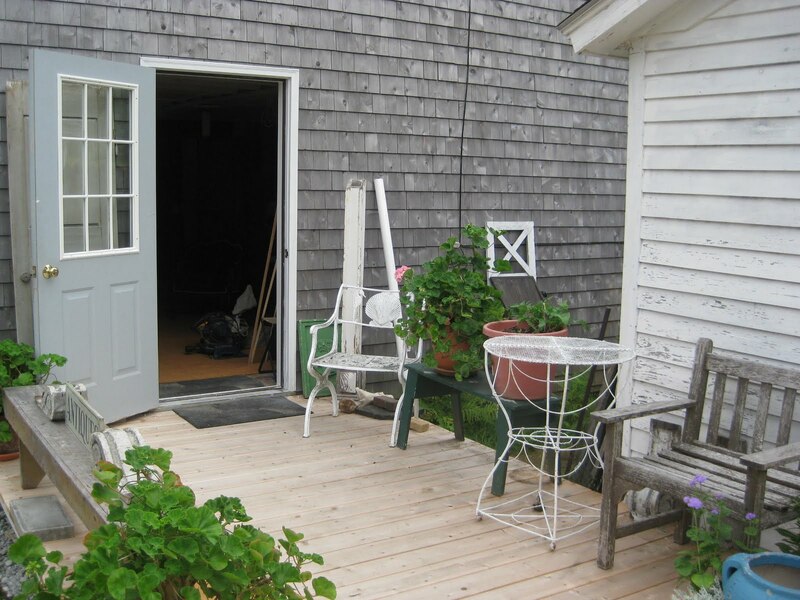 I wanted to improve my writing skills, and I thought I’d stake out a relatively untapped area of the blogosphere—architecture, design, gardening, and landscape with a New England, and particularly Maine, bias, and chosen mostly from the era of my childhood backwards. This choice was not from a sense of nostalgia, although nostalgia is the inevitable result, but because the newer work is already being well covered by a number of magazines and blogs, and because I noticed that too much of the good stuff that had gone before was not being valued on its considerable merits as it once had been or should be,, and I wanted to make a gentle plea for a gentler hand on the work of the past. As I continued to post, I found myself rambling around, and sometimes surprising myself with where I wound up. And I found delight in the thoughtful, intelligent responses that came as some posts resonated with readers. In the last few weeks, several months of cumulative overload have caught up with me and slowed down blogging.—-especially store renovations that seemed to go on far longer than they logically should have. This of course was the fault of my cheap labor, who seemed to learn on the job: my electrician, Dilettante Electric, my sheetrocker, Dilettante Drywall, and my carpenter, All Thumbs Dilettante. And we won’t even talk about the incredibly sloppy Dilettante Painters. The worst. A corner of the renovations that never end: Notice test vignette in background, with unfinished window frame at left, mitre saw at the ready in foreground, track lighting (finally installed eight hours ago) on the floor. The end has been in sight for days, yet it doesn’t arrive. Just as I was beginning to see daylight, my marvelous father, 84, a delightful guy who has been refusing all entreaties to visit his doctor for months, finally capitulated—as in “okay Dad, you have two choices: come willingly, or over my shoulder, but whichever choice, it’s going to be NOW” A former politician, pragmatic, he chose willingly, and off to the emergency room we went, followed by ten days of follow up visits and tests. With the store opening date well past, and my inner electrician, drywaller and carpenter all preoccupied with worry for my elderly father, I was needless to say, fully booked. The awful moment has arrived. Exterior painting. What color shall the doors be? Tasteful, classic Essex Green? Boring Taupe? Orange Popsicle? Maybe Sky Blue? This is the sort of decision that can paralyze me. As it is, I’ve left the interior in Primer White for the summer. Oh dear, I feel an attack of Exterior White coming on…..
Then, just as my father was stablizing and improving, came the heat wave. If there’s one thing in the world the Dilettante hates more than mean conservatives or silly social climbers, it’s heat and humidity in Maine. Perversely, I find it very appealing in tropical locations in all winter months, and will willingly pay thousands to put myself in the same soupy weather I get for free up here every July. Here I just fold up and melt. And complain. A lot. My brain and body both turned to thick syrupy goo, unable to function at any speed, yet there I was, hammer in one hand, paint roller in the other, and wire crimpers held in my teeth. Life just couldn’t get better. Or could it? Now, for those who think this is leading up to a decision to stop blogging, or continue the hiatus, guess again. I’m going to tell you even more about my week, and as promised, burnout is the operative phrase. I was driving the official Dilettante minivan (yeah, I know, antiques dealers drive the coolest cars. Try hard not to be jealous), returning from a trip to the dump (the perfect errand for 95 degree weather—-one comprehends the Decameron far better after such a journey. I was watching the heat shimmer on the highway ahead, when suddenly, a pick-up truck appeared behind me, in high agitation, honking horn, flashing flashers. Pulling over to let him by, he didn’t go by, but rather stopped alongside and announced in an urgent tone: “your car is on fire”. 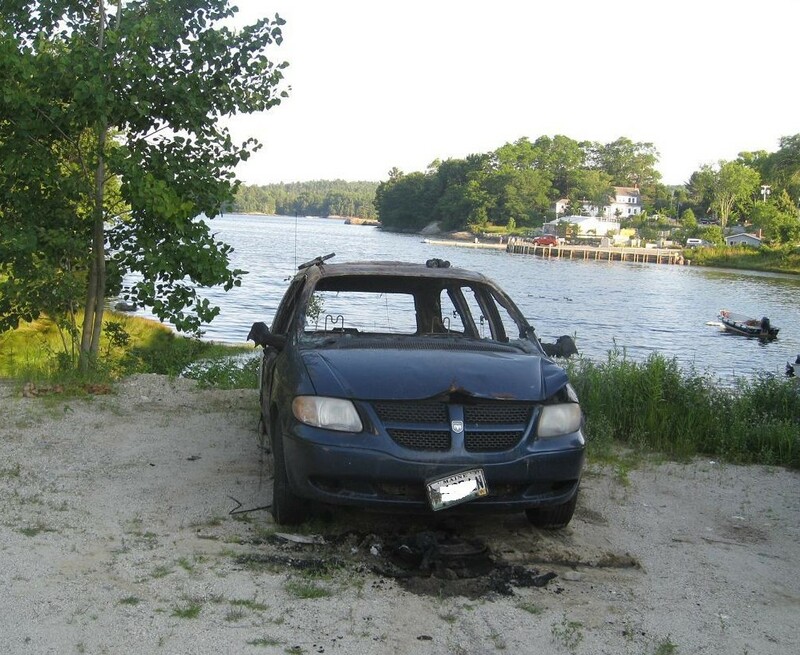 I got out, he pulled over, we dialed 911, and then, a minute later, the car exploded. By the side of the road, in 95 degree heat. It was most spectacular. Traffic piled up in both directions, tourists with movie cameras took pictures, as the flames and smoke spiraled up 30 feet, a neighboring tree caught fire, and yes, it really does look just the way it does in the movies, only without Vin Diesel. Then arrived the fire department. They sprayed some goo, and the fire was out. 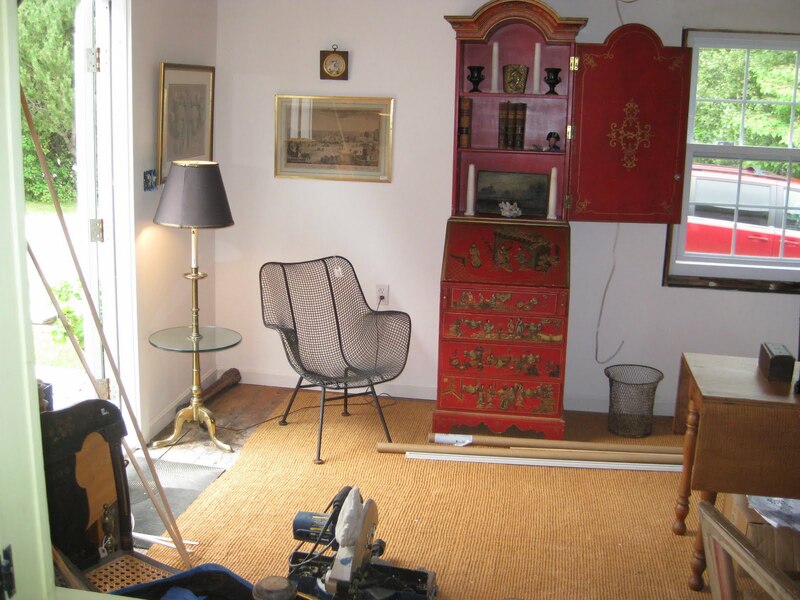 Unfortunately, I was planning a trip to Brimfield the next day, and the car was packed with overnight clothes, and with some architecture and decorating books and magazines en route from office to home. Oh, and some gardening stuff, likewise homeward bound. And some tools, including my great-grandfather’s level. But I was unharmed. And the Good Samaritan stayed for the whole thing. Friend Sidekick came out to get me, and here I am. On rte. 172, the burn site, with its scorched earth, and crater created by the explosion, remains a minor tourist attraction. Obama is visiting nearby Mt. Desert next week, and I expect the interest in my crater will die down while he’s here. And you thought I was joking about blogger burnout? How about blogger flameout? But, from the side, the effects of the explosion and fire are more clearly seen. I do not know you, except through these blogs, but I have wondered about you often when you were missing from the blog roll. I am happy you & those you love are well. I still have much to learn from you. My dad is the same age too. Living without one's parents would be unthinkable :(But I don't think it is blogger burnout.. it is life burnout. Sometimes life is too overpowering to do anything but survive, one day at a time. Car accidents, bulk heat, work issues, family issues, humidity, money problems… collectively they can be overwhelming. The blog can wait. So can everything else, except your dad and your own peace. Honey Bunches of Oats!That's more drama than a small town amateur production of Macbeth. Nothing wrong with Exterior White or Essex Green. I wonder if the gray shingles could be left as they are but it may be that the weathering without painting is too extreme. What do I know? Very sorry to hear about your father but pleased to read about your ability to carry him over your shoulder. I'm glad, as you clearly are, he's doing better. If 80-something is anything like 60-something then he's probably totally unwilling to believe that because the inside has remained 27-something the exterior needs more than a coat of paint to shore it up. 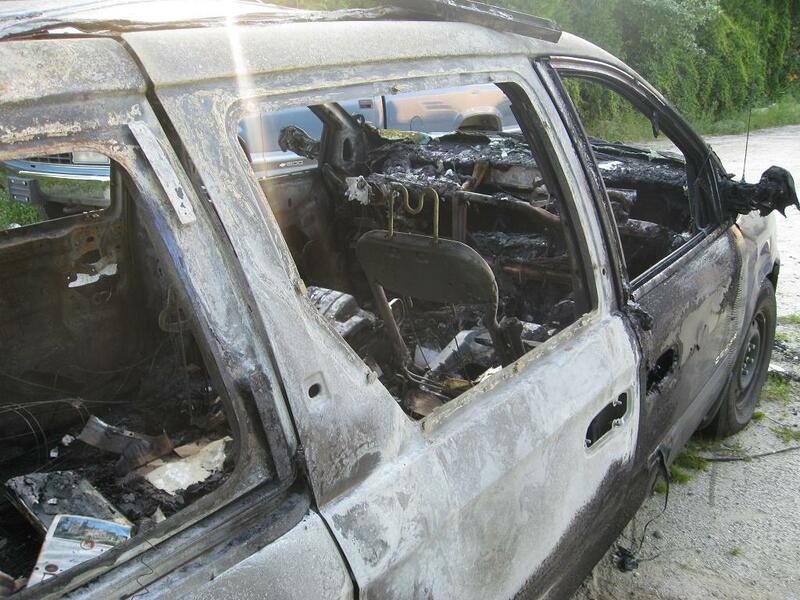 Scary, scary moment – your car bursting into flames! Glad, too, that you're OK and will not stop blogging as I first (in my totally selfish way) feared.Your continued good health! Those are scary photos. I'm glad someone was smart enough to flag you down and get you out of the car. I didn't think this was possible in modern cars. Wishing your father well, and remember paint can always be changed next week, on something as small as a door. I predict smooth sailing ahead. A spate of bad luck is always followed by double the number of good things. This is a well known fact.And when you're "down in the dumps", channel that cunning small red lacquer secretary/bookcase. if that doesn't banish the blues, nothing will. oh- and Essex green is the answer. OMG! So glad you're ok. Definitely a full summer. Any word on what sparked the fire? Oh, my goodness, thank heaven you are ok. I'd like to say there's nowhere to go but up, but I hate to tempt fate. I hope things seem a little more even soon.p.s. I have the equivalent of the DE work crew here. Blandings Painting and Blandings Clean Up and Hauling should be reported to the BBB. 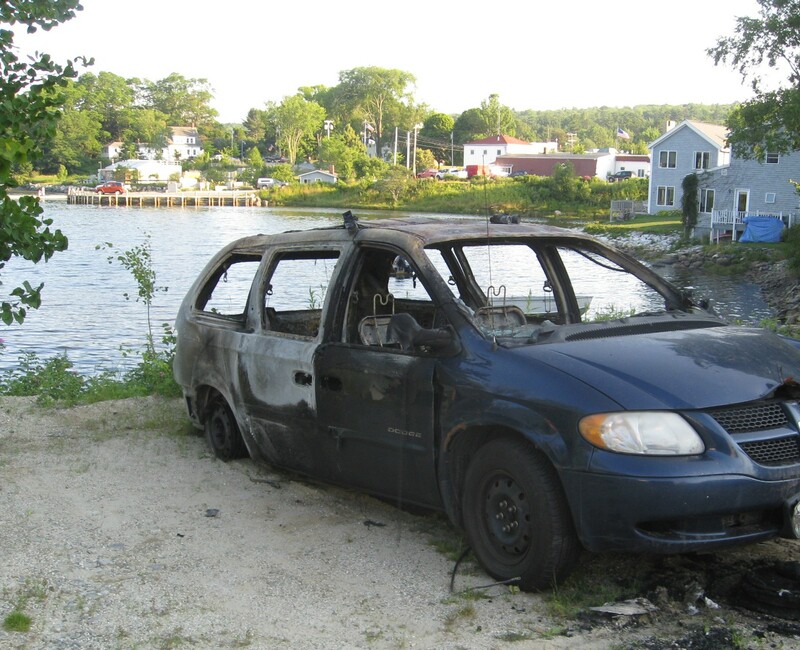 So picturesque: the burned-out minivan, the water in the background… At least you'll have a good landmark to use when giving directions to your shop: "Go right at the light, turn left at the skeletal remains of the incinerated vehicle, and stop when you get to the Orange Popsicle. "I'm glad you're OK, and hope your dad is feeling better, too. Perhaps you've had enough excitement for the summer? I can't believe your car exploded in the heat! At least you were out in the country rather than in the village. I find it quite interesting that one page from a historic magazine survived the flames… Seeing the other burned pages beside it is very sad. At least you made it out safely and met a good Samaritan along the way. On a more cheerful note, perhaps a gorgeous Early American blue for your door would be a nice choice next to the weathered shingles? It's not that I am callously ignoring the car fireor the family health issues when I suggest a colourfor that door; it's simply the only possible responseto your chain of worries! And yes indeed, if the exteriorshingles remain grey, then a very, very dark blue/black for that door, would seem to be the ticket. Painting every inch of the door, including muntins, is presumed? and JUST when I was starting to get worried…I HAVE REASON TO! Jesus Mary and Joseph, what a week?! I'm glad you're OK and are able to keep your witty self going. Don't make me call your mother! I don't even know where to begin with this post. I am nothing short of horrified to hear of this and see the photos. I am, above all else, very glad you are OK.
Down East -Glad to hear you are ok. Something similar happened to my father's car a few years back. As I recall the brake fluid was empty and that was why the car caught on fire. He had a good samaritan flag him down too.Essex Green is nice but I would lean more toward something like Prussian Blue or Carnelian. Cheers! Thank the gods you're safe. Your week tops mine by a mile. I have been slowed down a bit too recently, with life overload, but nothing like what you have been through. And you are still blogging! And still have a sense of humour – admirable. Been there, all of it, including the double parent/child brushes with death. Observation: no one is taking care of YOU, so you're gonna have to do it in order to be fully available to Dad. Rx: put the temporary brakes on everything. Clear your house, clear the shop, send the subs home til next week, hang "Closed, Gone Fishing" on the doors, set the phones to voicemail, put on a track suit and stay inside for a few days. You need a good hard crash. Well, I guess that's what they mean when they say somebody returned with a bang. Yikes! Actually, except for the fact that I don't have a blog audience waiting for a post, I was right there along with you for most of this–the project that drags on longer than it should because the energy/interest/skills ratio is always out of whack; dealing with the Aged Parent's I-don't-need-to-go-to-the-doctor routine; the physical & mental torpor that accompanies great heat–but at least none of my trips across town has turned into a sequence out of an action movie (not yet, anyway) with not only my vehicle but the landscape going up in flames around me. Bye, bye, Eden! I'm just glad you came through it all with enough good humor to share the whole bizarre event with us. What a week. Now, though, as Flo said, you've earned a rest and 'Gone Fishing' sounds as good an excuse as any. Oh, and the door? I don't have any of my paint cards with me, but this week, over on Stefan's post about San Francisco's City Hall, I was struck by the handsome European-style blue paint on the ironwork out front. The gold leaf accents might be a bit much for rural Maine, but that great blue might turn out to be just the thing. And I know that you'd have painted those glaring white muntins, even without Toby's suggestion, which more people need to heed. Meanwhile, while you think about the color, go lie down. That's what I'm going to do.We can all meet back here when we're rested. P.S. Before you go down for a nice deep crash, consider RED [or as my brother calls it "Episcopalian Red"] for your doors. Gorgeous with gray shingles and white trim. My brother's holy description notwithstanding, I find the gray/white/red approach to have just enough of a go-to-hell twist to a classic combo. Considering your life lately, why not think of it as SOS RED? I always mix my own Episcopalian Red door paint [and apply it myself, as well] from OTC cans of Rustoleum "Regal Red, Gloss" mixed with Rustoleum "Leather Brown, Gloss." Absolutely perfect every time; stop mixing as your desired shade of red emerges. Here's the deal: it's even better if you change your mind and decide you want Magna's San Francisco blue next week because there's nothing more authentically Down East than heavily-layered coats of paint slathered year-after-year over aged, chipped surfaces. Oh DED forgive me coming along so late in the day to express my relief you aren't DEAD. What a horrible experience piled on top of your other difficulties, but the droll way you were able to recount it all means that the Phoenix is definitely rising from the ashes. Your father needs you more than we do right now but but we can wait patiently for more of your engaging and amusing posts sometime. Don't ask me about the colour for your front door. I painted mine defeatist white according to dear old Mr TW! Dear Everybody,Wow. So many responses, so little time. Thanks for all the good words, and humor—-and for the excellent paint suggestions. Now I'm even more undecided! It works that way. My shop may be identified soon by the patchwork of samples on the doors…. This is one of those "Well, apart from that, Mrs. Lincoln, how did you like the play?" moments. I can see I'm late to this particular cook-out! God bless the good Samaritan!Regards and best wishes to your Dad. I hope he is doing better.